The ITU has just put out a new report showcasing some astounding numbers on general internet penetration, mobile broadband (wireless) use, and how the developing world compares to the rest. 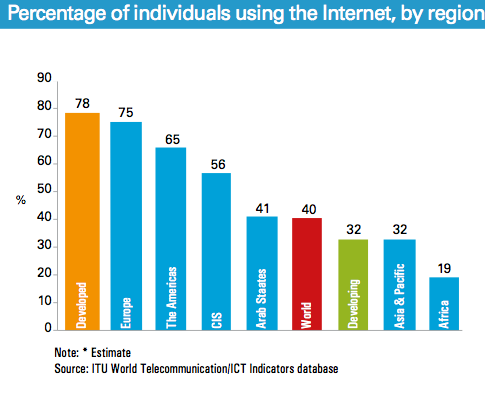 Internet user penetration has reached 40% globally, 78% in developed countries and 32% in developing countries. 2014 growth rates in developed countries remain at a relatively low, at 3.3% compared with 8.7% in developing countries. In developed countries, mobile-broadband penetration will reach 84%, a level four times as high as in developing countries (21%). Almost 7 billion mobile-cellular subscriptions worldwide – The developing countries are home to more than three quarters of all mobile-cellular subscriptions. Fixed-broadband growth is slowing down in developing countries. Almost 3 billion people (40%) are using the internet. In Africa, almost 20% of the population will be online by end 2014, up from 10% in 2010.